Summer strolls are one of my favourite pastimes. I like nothing more than to walk down the street, watching people go by on their way to do this or that. Of course, people watching occasionally requires you let your stomach rule and pop into a local eatery. It was on one such adventure that I found myself stopping for lunch at The Five Point on Main Street. The interior of the public house was done up in mirrors and wood panelling with dim lighting and chandeliers. All it needed was a haze of smoke to feel right at home in an episode of Mad Men. The patio isn’t spacious, but is well-organized for a good view of Main. The servers were very friendly and provided some stellar service. As the menu emphasized their flatbreads and healthy selection of beer, I decided that would be where I focussed my gastronomical exploration. First I paired the Bristol Bread with a White Bark Witbier from Driftwood breweries. The Witbeir was a little light for my liking, and too citrusy and malty. I don’t normally like to cut my beer with lemon, but it greatly improved this one. The Bristol was an interesting combination of boar bacon and Brussel sprouts, garnished with crispy onions and topped with provolone. If you’re not offended by the slightly bitter mini cabbages, it’s definitely an interesting dish to try, though in need of a little salt and maybe some herbs to complete the rustic nature. Like the Witbier, It benefited greatly from a squeeze of lemon. Brussel sprouts are a difficult vegetable to work with and I felt the novelty of the dish was more impressive than the actual taste, which fell short of the mark. The crispy onions were hard to detect and the provolone weighed the whole dish down. 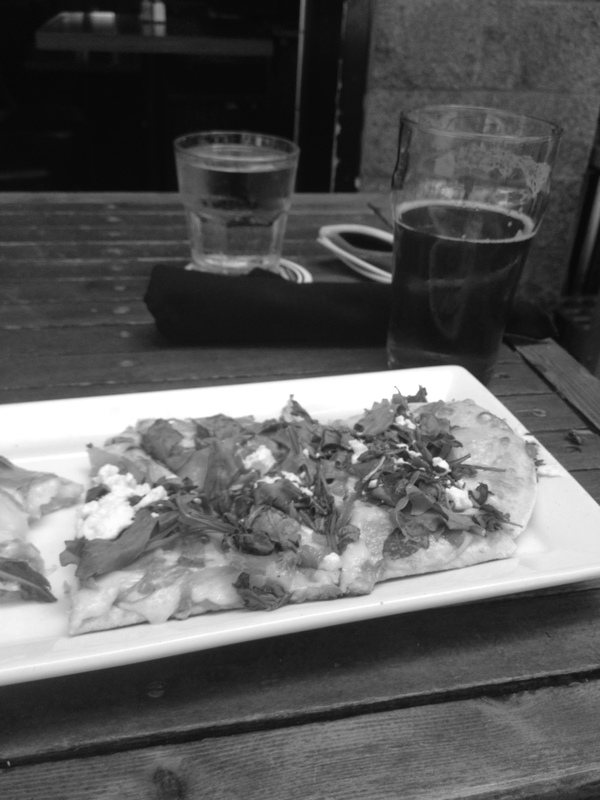 Next I paired the Huntsman flatbread with a Strange Fellows Nocturnum―a vast improvement on both beer and dish. The Nocturnum was a surprisingly mellow dark IPA, picking up on all the notes the Witbier missed. Dark, lightly hoppy, and mellowly intense. It was a good drink on its own or paired with the flatbread. As for the Huntsman, it was amazing! A delicate balance of goat cheese, prosciutto, oyster mushrooms, arugula, caramelized onions, and smoky béchamel. This is one of the best flatbreads I have had in a while. Everything was light and well-balanced, with the saltiness of the prosciutto balancing the creaminess of the goat cheese, the sweetness of the onion, and the zip of the arugula. There was no heavy cheese weighing this dish down, and I would go back just for the Huntsman. I have to give The Five Point credit for their creativity with flatbreads―and though the Bristol disappointed, there are more than a few gems hidden within their menu. The Five Point can be found at 3124 Main Street, Vancouver, BC.